Insightful Intelligence Consultancy Private Limited (IICPL) is a young management consulting firm incorporated in India, helping the world’s leading companies in mitigating the risks in today’s volatile business environment. We assist our clients with insights and intelligence of the prevailing business environment and existing competitive dynamics, which help them to grow their business by minimizing the risks and out-perform their competitors. 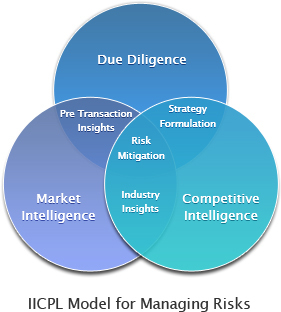 IICPL provides a right mix of services including due diligence, market intelligence and competitive intelligence services. IICPL has experienced pool of professionals who have assisted many Fortune 1000 companies in the past in carrying out multi-billion dollar transactions and investments. IICPL focuses on various sectors including Healthcare, Pharmaceuticals and Life Sciences Infrastructure & Real Estate, Information Technology, Automobiles, Manufacturing and Retail sector. June 2011: IICPL registered as a private limited entity in India and commenced operations. IICPL commenced operations in India and offers a wide array of due diligence, market intelligence and competitive intelligence services in India and neighboring countries including Sri Lanka, Bangladesh and Nepal. IICPL expands the geographic coverage of Competitive Intelligence services to South Asian region including Philippines, Thailand, Singapore, Indonesia and Malaysia. IICPL’s CEO & Director (Operations) will be discussing about “Information Collection and Analysis Models in Emerging Markets” in the 2011 SCIP European Summit on 09 November in Vienna, Austria. Copyright © 2011 Insightful Intelligence Consultancy Pvt. Ltd.